WELCOME TO TOP GUN TATTOO, THE TATTOO aCademy. 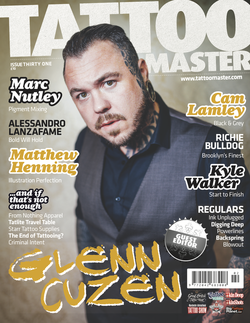 ​HOME OF INTERNATIONAL MULTI AWARD WINNING TATTOOIST GLENN CUZEN. Situated in the heart of Reading, Berkshire; Tucked away in the quirky Harris Arcade here resides Top Gun Tattooing - "The Tattoo Factory"! Top Gun Tattoo first opened its doors to the public in 2011 since then has gained prowess and become a well known and distinguished tattoo studio, home of International Multi-award winning tattooist Glenn Cuzen. ​As a studio Top Gun Tattoo offers a high caliber of varied tattoo styles ranging from Glenn Cuzen’s award winning Geometric Dotwork to black and grey realism, Illustration style watercolours and the timeless Neo-Tradtional. Within the studio there are 2 tattooist's to adequately support you on your tattoo journey, giving the best advice over their combined 20 years worth of experience.